Potassium is found in almost all of the foods you eat -- fruits, vegetables, meats, dairy products and legumes. 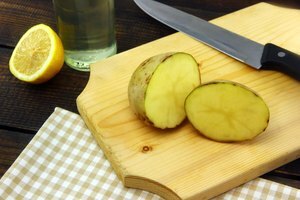 Leaching high-potassium foods such as potatoes is a simple way for people who are at risk for or have elevated blood potassium levels to help reduce the amount of the mineral in their diet. 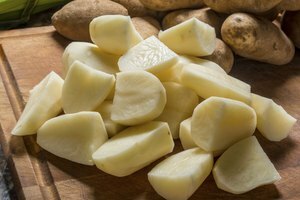 To leach potatoes, first peel the vegetable and slice it into very small cubes. Next, rinse the cubes for a few seconds in warm water, then place them in a pot using about 10 times the amount of warm water as there are potatoes. Soak the potato cubes for a minimum of two hours. 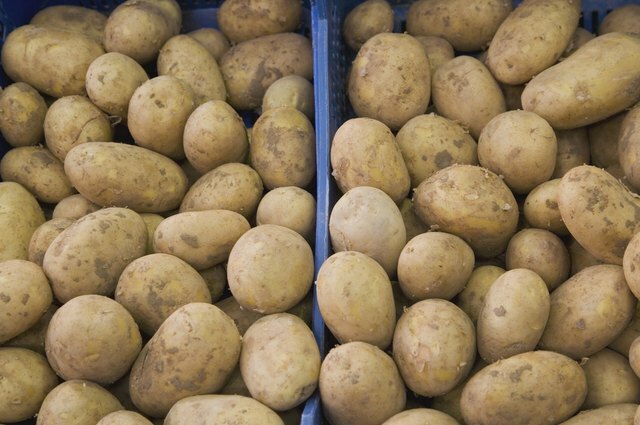 If you plan to soak the potatoes longer, change the water every four hours to keep it warm. 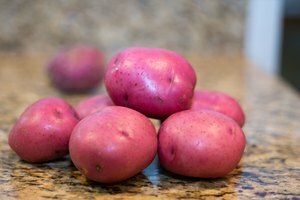 When it is time to cook the potatoes, first rinse them in warm water, then cook them in a pot that contains a ratio of 5 parts water to 1 part vegetables. 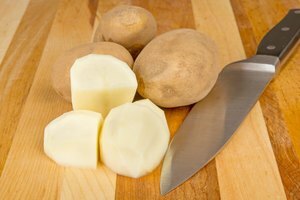 Dicing, slicing and grating potatoes before soaking them, using warmer temperatures of water to soak or boil potatoes and using a large volume of water all contribute to greater potassium reduction. Dicing and grating increases the exposure of the potatoes’ surface to water, allowing more potassium to leach out. Grating potatoes allows for the most surface area to be exposed and thus more potassium to be lost in cooking. Boiling diced or grated potatoes in a large volume of water for at least 10 minutes is the most effective cooking method to reduce potassium content. According to a study published in 2008 in the "Journal of Food Science," boiling decreases potassium content by 50 to 75 percent in previously diced or grated potatoes. This study also found that boiling alone reduces potassium just as effectively as presoaking and boiling potatoes. Another study published in 2008 in the "Journal of Renal Nutrition" found that double-boiling potatoes removes more potassium than normal boiling, meaning boiling the batch just once. To double boil, you must bring the batch of potatoes to boil, drain the water, then boil the batch in a new pot of water for five to 10 minutes or until tender. 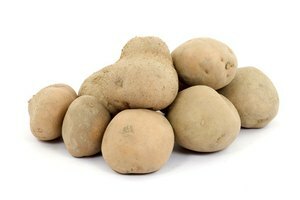 Canned potatoes go through a natural leaching process, as they are soaked in the canned water, and usually contain about 200 milligrams of potassium per 1/2-cup serving. 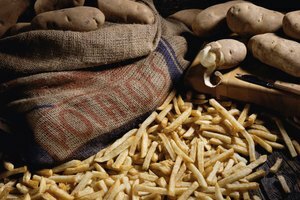 Instant potatoes are highly processed and contain about 150 to 220 milligrams per 1/2 cup, as they lose potassium during processing. Frozen or home-prepared hash browns tend to be higher in potassium, containing about 340 to 450 milligrams per 1/2 cup. Soaking or boiling the grated potatoes before frying them to make hash browns can reduce potassium content to 100 to 150 milligrams per 1/2 cup.